I am heartily addicted to attending auctions. And not necessarily to buy anything. Honest. In a large part, I just love the frenetic atmosphere, the social buzz of congratulations and irritation, and the calculated bidding of long-time pros. I’ve learned the all-important lesson that nearly every piece of beautiful old furniture, while unique, is not the only lovely piece that will ever sell at a great price. That said, every now and then I find an item that is just fantastic, and truly rare. In this case, it was a pastry jagger, probably from the early to mid 19th century. Now what, you might ask, is a pastry jagger? It’s essentially a historical kitchen unitasker, meant for cutting pastry dough with its wheeled end, and poking holes in it with the (sometimes) tined end. I had only recently learned about these implements, so when I saw one at the auction, I knew I had to try to get it. I stealthily built a box lot (totally allowed at this auction) of Pyrex, assorted dishes that looked boring and valueless, and the pastry jagger in a baggie with a couple of clay pipes. Fortunately, the auctioneer didn’t list my top pick when enumerating the contents of the box, so there was next to no competition for it. The fellow sitting behind me was very surprised when I pulled this out of my box of loot, and declared it a “great buy”, a high commendation from one auction-goer to another. Anyhow, I thought it was just a delightful little thing, and wanted to share a few pictures with you! Now this is a very nice collection theme! Antique kitchen implements, tools, and utensils. Check flea markets, second hand shops, and auctions, sure. Wonderful! Do you think it is carved from whale bone or ivory? Also – I can’t tell if the tines are broken? Looks like fun! Great buy! Thanks! I think it’s almost certainly bone or ivory- only about 7″ long. One tine has snapped off, but the other two are just as pokey as ever. 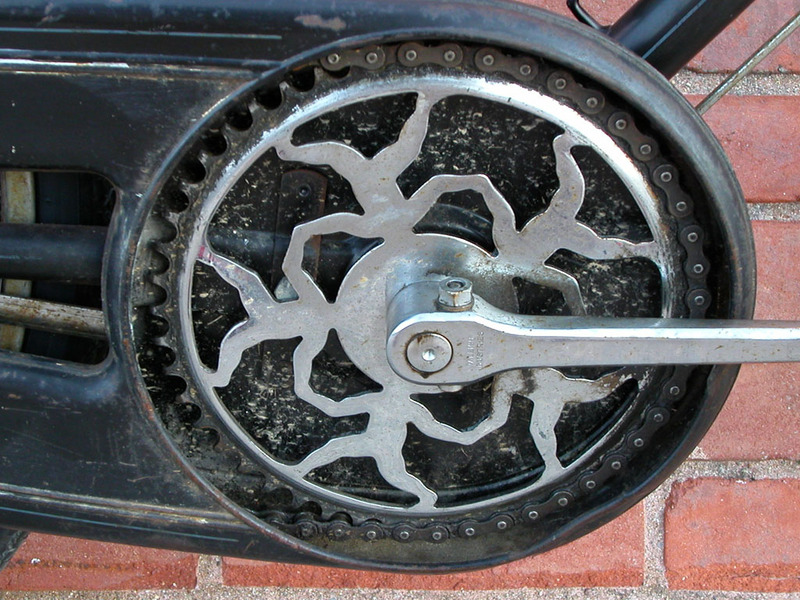 The wheeled end looks very much like the Morris Men / Maypole motif similar to the chainring of a Humber, a brand of English 3-speed bicycles from the 1880’s to the 1930’s before being acquired by Raleigh until the 1970’s.